I really love to travel. Over the years of travelling I accumulated a lot of useful travel gear and I realised that people who do not travel regularly often have really bad gear or have no clue what they really need. So I decided to do some posts about my gear in this blog. I will try to include where you can get it and why I think its usesfull. My needs might be different from other people needs since I travel not only privately but also as part of my job. In addition I happen to put a lot of strain to my gear since I travel more often then not to places where no tourist will ever go. In the following I will review my writing gear. I write a diary, not only when I travel, but mostly. So I carry the diary, pens and ink everywhere. For a couple of years I had all this at different places or bags, but lately I have it all neatly together in a really cool Folio. The last 10+ years I used Moleskine Mini Journal, the standart edition. I never had problems with my black MontBlanc Ink until NOW. The paper Quality of Moleskine has changed and is not suitable for my black Ink any more. It bleeds through very very badly. I am quite sad about this. I did not at all like how Moleskine reacted. They stated that the paper quality is the same … which I can proof wrong with a stack of books without bleed through (same pen, same ink) and a new one with a bad problem. Moleskine reacted on facebook telling me I am a stupid customer and they did not at all react when I wrote to their support. So good bye Moleskine, sell your cheap china made Product to others. Leuchtturm 1917 and they also have a very cool Version bount in Linen. I find the Paper to be much better Quality than the usual Moleskine paper. There is no bleed through and it is exceptionally well suitet for fountain pens. Since this book is in size A6 it is a little bigger than the Moleskine Mini but it fits nicely in the below described Folio. The same goes for the Brunnen Kompagnon which is a little smaller than the Moleskine Mini, but also comes in much much better Quality and works with Fountain pens and most Inks. Over the years I was always looking for a good traveling solution to keep my diary. I found it at Rickshaw Bags, unfortuantely for the bigger Moleskine Books. Well after contacting them, I was informed that they do make those really cool Folios for Moleskine Mini as well. 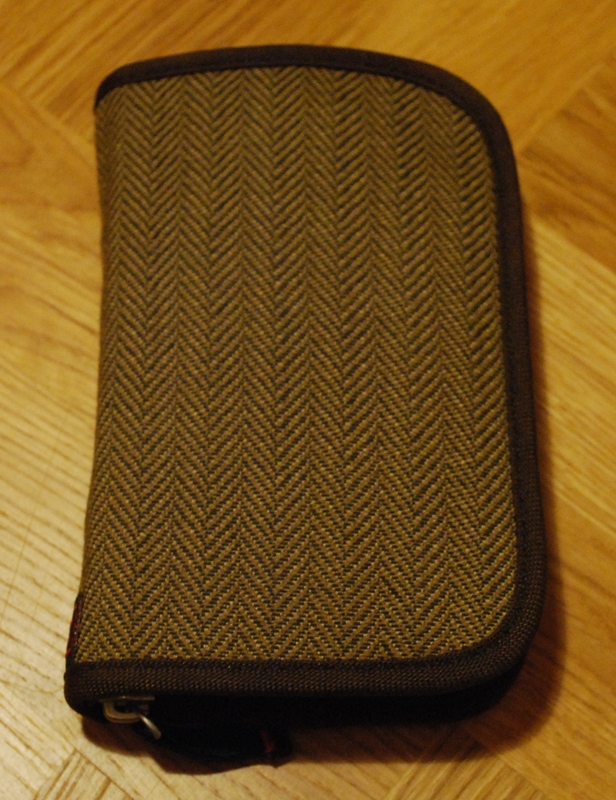 It fits also very nicely A6 Books or smaller ones like the Brunnen Kompagnon. I actually ordered a big one (for Work, there I write in bigger Moleskine or A5 Books under bad conditions e.g. in a Factory somewhere in Russia or at -35°C outside the same Factory) and a “make it Mini” One (see picture). You can find these Folios here: Rickshaw Bags Moleskine Journal. No this is a cool Item! The Journal fits very nicely, there is room for my pens, Ink and some collected thingys and snippeds. All needed to write a diary anywhere are safely under a zipper and in ONE bag only. So when I go to a pub in the evening or find myself in the Transsiberian Train, I have it all in one grab. So far my Folios have gone through 3-4 Trips to Russia and Sweden and they really are durable and practical! I love this Folio. Since I use Fountain pens, I need to carry Ink. This was never really a problem since I used the same black Ink most of the times and it comes in standart cartridges, but lately I found some interest in ink. It all started with the darn moleskine with the bad quality paper. Since I did not want to retire a diary to the bin or stop writing in it, I tried different inks to find one which does nopt bleed through the paper. This opened a whole world of interesting Inks for me. Ink is Alchemy, really! And I also found some “magickal” effects of the inks. I actually write differently if I use different colors. On top of that, hey the writing experience really does change quite a bit with different inks … and there a really cool Inks out there. I might write something about this and the impact on sigils and such like. To cut this short, cool Ink somehow never comes in cartridges but in Ink Well. My pen (uses a converter) holds Ink for about a week, maybe even less. 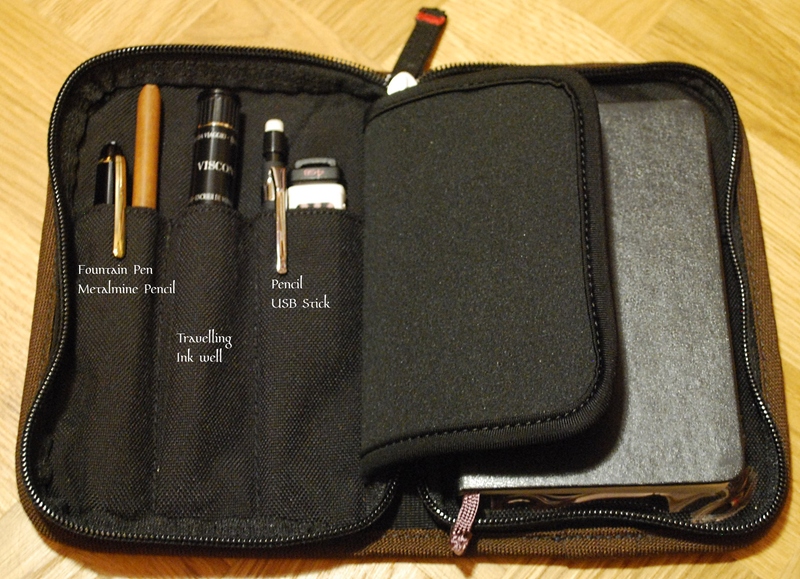 So I started searching the web and found this really nice Travelling Ink Well from Visconti (I think its the one and only modern traveling ink well). I found it much much cheaper here in Germany, but you can get it here. The Well functions very well with my Montblanc Pens and, since its about the sice of an Edding Pen, it fits nicely in my Folio. So I carry now Ink for more than 6 Weeks of Travel. Its clean, makes no mess and is easy to use, I do not want to miss it again. … so much so far about some gear I use. ~ by Otto on July 24, 2013.